Today’s employees expect training and skills-building programs that let them learn at their own pace. Self-directed eLearning courses enable employees to weave learning into their workdays, mastering a variety of new behaviors and skills while maintaining productivity. Abreon’s team is constantly exploring new ways to innovate learning—ensuring that we are building content for audiences of different needs and delivering results. Abreon is a recognized leader in the learning industry with proven results for global organizations. A leading appliance manufacturer was looking to control their cost structure to prevent competitors from challenging their products and eroding their market share. Abreon’s eLearning foundation course was required for all 4,000 knowledge workers and 15,000 manufacturing employees. A large international medical supplies company realized that their instructor-led employee orientation program was time consuming, costly, and inconsistent. Abreon created an alternate model of delivering this training to give employees on-demand access, ensuring the long-term success of the program. A major consumer goods organization was looking to quickly create a baseline knowledge throughout the organization on change management. Abreon built an interactive eLearning course allowing the geographically-dispersed audience to apply their knowledge in a simulated learning environment. 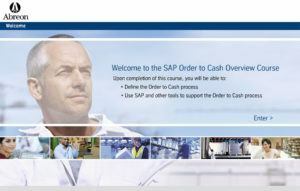 A multinational conglomerate was in need of interactive eLearning courses to train employees on the SAP Order to Cash product and processes. Abreon completed this course featuring custom graphics, professional audio, and interactive demos, utilizing drag-and-drop activities and knowledge checks to test what the user has learned. Identify training needs and develop customized programs that build organizational competencies and drive business results. Develop highly interactive eLearning with energetic videos, 3D environments, and gamification. Create role-based learning plans to maximize productivity. Provide blended learning to accommodate all learning styles, abilities, and organizational cultures. Manage large-scale learning programs, training logistics plans, and LMS administration. Produce learning content in concert with change management, communication, and training strategies. Ensure learning is effective and measurable to maximize the value of the investment.